Since the inception of the college, Vykhan Mala is a lecture series organised on 6th December every year, on the death anniversary of Dr. Babasaheb Ambedkar. For these lecture series, some very renowned speakers have delivered lecturers on various facets of life and works of Dr Ambedkar. A collection of these lecturers were compiled by the institution in a book form. 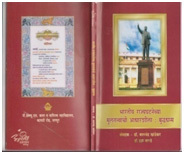 It is a rare collection and it carries some very useful insight into the life and works of Dr. Babasaheb Ambedkar. Cenacle an Annual Peer Reviewed Research Journal, a collaborative venture of Dept of English.